Airy embroidered design with flutter sleeves Roundneck Short flutter sleeves Back zip closure Polyester Machine wash Imported. Children's Wear - Classic Children. Carrément Beau. 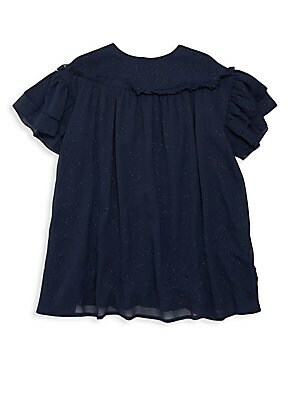 Color: Bleu C. Size: 10. Airy embroidered design with flutter sleeves Roundneck Short flutter sleeves Back zip closure Polyester Machine wash Imported. Children's Wear - Classic Children. Carrément Beau. Color: Bleu C. Size: 12. Airy embroidered design with flutter sleeves Roundneck Short flutter sleeves Back zip closure Polyester Machine wash Imported. Children's Wear - Classic Children. Carrément Beau. Color: Bleu C. Size: 6. Airy embroidered design with flutter sleeves Roundneck Short flutter sleeves Back zip closure Polyester Machine wash Imported. Children's Wear - Classic Children. Carrément Beau. Color: Bleu C. Size: 8. 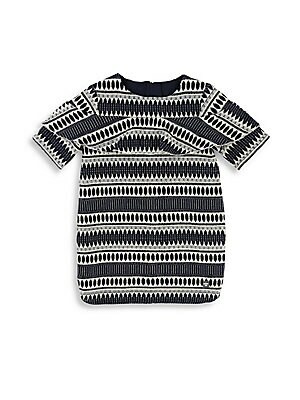 Graphic jacquard print with sparkling metallic threads Roundneck Short sleeves Pull-on style Cotton/acrylic/metallised fiber Machine wash Imported. Children's Wear - Classic Children. Carrément Beau. Size: 10. Graphic jacquard print with sparkling metallic threads Roundneck Short sleeves Pull-on style Cotton/acrylic/metallised fiber Machine wash Imported. Children's Wear - Classic Children. Carrément Beau. Size: 12. Graphic jacquard print with sparkling metallic threads Roundneck Short sleeves Pull-on style Cotton/acrylic/metallised fiber Machine wash Imported. Children's Wear - Classic Children. Carrément Beau. Size: 6. Graphic jacquard print with sparkling metallic threads Roundneck Short sleeves Pull-on style Cotton/acrylic/metallised fiber Machine wash Imported. Children's Wear - Classic Children. Carrément Beau. Size: 8. 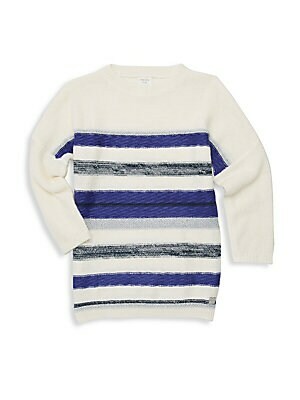 Stripes of varying widths are enhanced by pops of glitter on this playful pullover sweater. Crewneck Long sleeves Ribbed cuffs and hems Pullover style Cotton/viscose/polyamide/wool Machine wash Imported. Children's Wear - Classic Children. Carrément Beau.